Brandywine is a project desiged by Robert M. Gurney, FAIA Architect, located within close proximity to Rock Creek Park, and with easy access to the shops and restaurants on Connecticut Avenue, this large lot in Northwest Washington, DC presented a desirable opportunity for a young family to build a new house in this sought-after neighborhood. Designed to respect both the scale of neighboring houses and the rhythm of the streetscape, the project aligns with adjacent houses while retaining the vast majority of mature trees and green space located between the street and the house. Materials composing the exterior, which include stone, wood and stucco, evoke traditional materials found throughout the neighborhood. The house appears relatively solid when viewed from the street with strategically placed windows insuring privacy to the street-facing spaces. The “L” shaped house is organized around the outdoor living spaces and swimming pool, and is oriented towards the large, south facing rear yard. Floor to ceiling expanses of glass provide ample visual and physical connectivity to the terraces, the swimming pool and the wooded landscape beyond. A screened porch, covered deck, roof top deck and balconies continue this dialogue. A small bridge and a stone path engage the house and terraces with the wooded, less manicured landscape at the rear of the property. The interiors are warm, light filled and ordered with a clear spatial organization. Various wood species, including white oak, Santos mahogany, rosewood and various zebrawoods (all forest certified or reconstituted products) combine with limestone and various granites to provide a rich material palette. 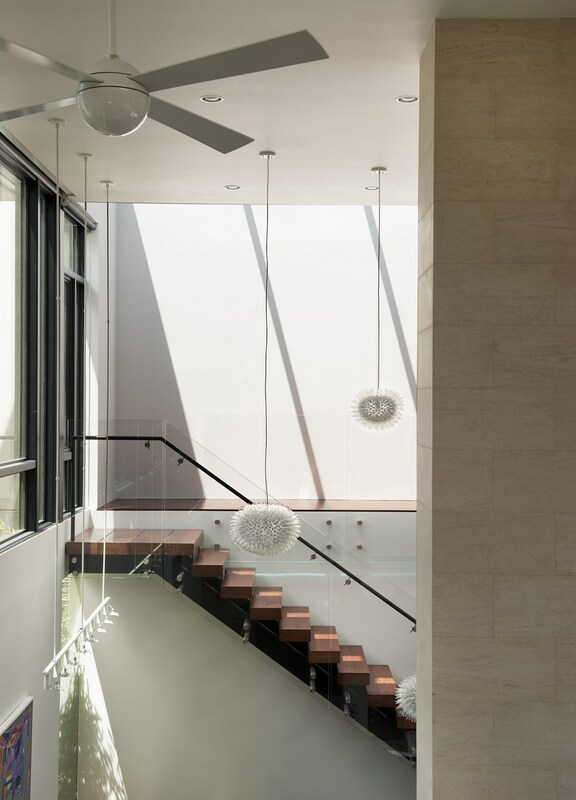 Generous use of skylights creates changing light conditions that activate the interior. Despite the relatively large size of this house and the extensive use of glass, the house remains incredibly energy efficient. While the large amount of windows and skylights provide generous day-lighting, computer programmed shading devices modulate solar gain. A geothermal HVAC system, including hydronic heating, combines with solar hot water tubes and photovoltaic panels with the goal of providing a net zero energy house. This project is intended to be respectful of its established neighborhood while infusing a modern sensibility for aesthetics, functionality, ecology and technology. This entry was posted in bathroom, bedroom, house, kitchen, living, outdoor, pool, terrace and tagged bathroom, bedroom, Brandywine, contemporary house, FAIA Architect, home, house, house idea, houseidea, kitchen, living, myhouseidea, outdoor, pool, Robert M. Gurney, terrace, villa on September 29, 2015 by admin.